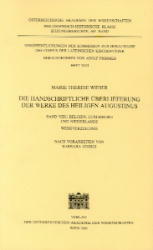 The catalogue of the manuscripts of Belgium, Luxemburg and the Netherlands is now presented as Volume VIII of the series “Die handschriftliche Überlieferung der Werke des heiligen Augustinus”. Part One (Catalogue of works) presents not only Augustinian and current pseudo- Augustinian works, but also lists the sermons and texts ascribed to St. Augustine, as was also effected in Volume VII. Part Two (Catalogue of libraries)compiles all the manuscripts (about 1200) by country, location and signature. The fact that about one quarter of these manuscripts contain Dutch translations of Augustinian and pseudo-Augustinian works might give an insight into the reception of St.Augustine not only to the editors of St. Augustine but also to medievalists, historians, and theologians. Indices of authors and initia ensure that the information required will be found easily.